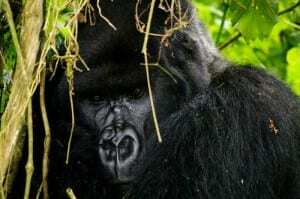 Rwandan safaris are all about gorillas! The scars of Rwanda’s genocide in the 1990’s still run deep, but the country has since benefited from a major political and infrastructure upheaval and is now forward-looking and optimistic. Low level eco-tourism is starting to take off, with gorilla safaris in Rwanda being the prime draw in this small landlocked country. Rwanda – “the land of a thousand hills” – is made up of hills, mountains and volcanoes, and forms a natural buffer state between the Democratic Republic of Congo and Uganda. The country is one of the most densely populated areas on earth, with virtually every hill terraced and farmed to make maximum use of the land. The only exception is the handful of national parks that Rwanda is home to, where the rain-forested hills reaching to the horizon makes for stunning vistas. The Virunga volcano range is home to a fair portion of the world’s last remaining mountain gorillas – estimated at only 700 in the wild. Tracking mountain gorillas in their natural habitat through tropical jungles and rainforests is unquestionable the highlight of any safari in Rwanda, though other primate and money trekking opportunities are also available. Tracking a family of mountain gorillas through the dense, hilly rain-forest of the Parc National des Volcans. Spotting our closest living relative on a chimpanzee tracking expedition at Parc National de Nyungwe. Taking time out of wildlife spotting with some beach time and stunning views of steamy Democratic Republic of Congo on Lake Kivu. Because of the altitude, Rwanda generally enjoys a pleasant climate with maximum temperatures of 30 degrees. Of course, the higher up the mountains you go, the cooler it gets- particularly at night when you’ll need several layers to stay warm. Rwanda has four seasons – two dry seasons broken up by a “long” rain from March to May and a “short” rain from October to December. The northeast of the country sees the most rain where high volcanoes are snow-capped and the lower slopes covered in rainforest. You can visit the country to track gorillas at any time of year, but bear in mind it’s a much hard slog through the rainforest if you safari in the rainy season. On the plus side, during rainy season the country is at it’s most lush and verdant, whereas during dry season the hilly landscape can look rather brown and barren. July and August is peak tourist season, so you’ll either need to book your gorilla permits well in advance, or consider visiting the country at a different time. Budget safari accommodation in Rwanda is centered around the villages on the edges of national parks, and in some cases is located a little distance, making private transport necessary. If you have larger budget then Rwanda offers the usual luxury safari accommodation in and around the parks. There’s only low-level tourism in Rwanda at present, and the vast majority of tourists are here to see the gorillas. As such, most safari tour companies in Rwanda specialize in obtaining those all important gorilla permits, and laying on a package to get you from the capital to Parc National des Volcans. Read our list of recommended safari tour companies in Rwanda. Have you been on safari in Rwanda? We’d love to hear your recommendations or suggestions! Please get involved in the comments below.